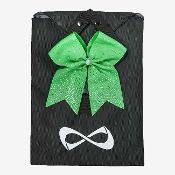 We have great prices on Nfinity Backpacks and Zuca Bags! The Nfinity® Classic Backpack is the perfect lightweight bag to get you through the rigors of school to traveling on the road. Mirrored after the Nfinity a shoe case, this hard exterior Makeup case protects while the interior zippered compartments organize your jewelry, makeup, and toiletries, and the eight-piece brush holder promises to protect the integrity of your set. Great for cheerleaders, dancers & skaters! Nfinity Uniformer. Introducing the first-ever uniform organizer. You’ll wonder how you ever managed before the Uniformer. 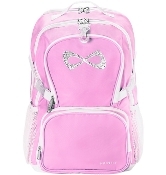 This is a cheer must-have item for any cheerleader. ZUCA Hot Pink Insert is quilted with rhinestone accents. Frame Included. These bags are great for kids on competitive sports teams. You can use them to haul all your gear and you can sit on them when seating is limited at competitions. ZÜCA Mystic Insert & Frame is quilted, rhinestone accented, and very chic. ZÜCA bags are great for kids in competitive sports like cheer, skating, gymnastics or dance. You can use them to haul all your gear and you can sit on them when seating is limited at competitions. ZUCA Pro Travel Heather Aqua & Silver Carry-On Bag. You can easily fit between 6-7 days worth of clothing (depending on the season) into one of the best carry-on pieces of luggage you can own. Great for the professional, leisurely traveler or for kids who travel on competitive teams. ZUCA Pro Travel Heather Plum & Silver Carry-On Bag. You can easily fit between 6-7 days worth of clothing (depending on the season) into one of the best carry-on pieces of luggage you can own. Great for the professional, leisurely traveler or for kids who travel on competitive teams. ZUCA Pro Travel Black & Black Carry-On Bag. You can easily fit between 6-7 days worth of clothing (depending on the season) into one of the best carry-on pieces of luggage you can own. Great for the professional, leisurely traveler or for kids who travel on competitive teams. ZUCA Pro Travel Black & Silver Carry-On Bag. You can easily fit between 6-7 days worth of clothing (depending on the season) into one of the best carry-on pieces of luggage you can own. Great for the professional or leisurely traveler or kids on competitive travel teams. ZUCA Pro Travel Graphite Gray & Black. You can easily fit between 6-7 days worth of clothing (depending on the season) into one of the best carry-on pieces of luggage you can own. Great for the professional or leisurely traveler or kids on competitive travel teams. ZUCA Pro Travel Graphite Gray & Black Carry-On Bag. You can easily fit between 6-7 days worth of clothing (depending on the season) into one of the best carry-on pieces of luggage you can own. Great for the professional or leisurely traveler or kids who travel on competitive teams. ZUCA Pro Travel Royal Purple & Black Carry-On Bag. You can easily fit between 6-7 days worth of clothing (depending on the season) into one of the best carry-on pieces of luggage you can own. Great for the professional or leisurely traveler or kids who travel on competitive teams. ZUCA Pro Travel Ruby Red & Silver Carry-On Bag. You can easily fit between 6-7 days worth of clothing (depending on the season) into one of the best carry-on pieces of luggage you can own. Great for the professional, leisurely traveler or kids and parents with competitive travel teams.